Oh my word, the owner of The Ironbridge Bookshop sounds amazing! Meg is the youngest bookseller in the UK and just reading about how her bookshop was born gave me wonderful shivery goosebumps, she adores Terry Pratchett too so I really I want her to be my book friend (that isn’t meant in a scary way, I promise Megan!). 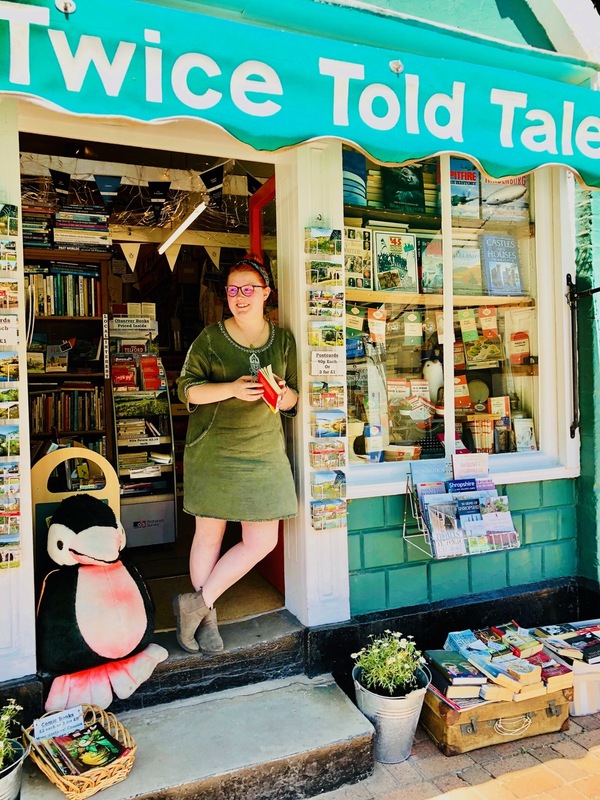 I loved reading all about the Ironbridge Bookshop, another shop passing on book love, and of course we are all about sharing book love here at LoveReading. It’s been a bookshop for around 8/9 years. I remember first going in when I was about 13 and I spent a lot of time there after school and at weekends. The gentleman who started it up asked me to help him organise the shop in exchange for as many books I could carry home (I was so excited). There were just books everywhere as far as the eye could see but it was fun to sort it into some order. Over time I worked for him properly and as I got older, he left me in charge at weekends and when he was away. In 2014 I was finishing sixth-form and had plans to travel, then to come back to the shop. Whilst I was away the guy I worked for retired and sold the business on quite quickly. I was going to work for who had taken it on when I was back home but struggled to get in touch with him. When I eventually did, I learned that it was up for sale again. At 18 years old I used the rest of my savings and with a little help from my wonderful parents and grandparents, we took on the Ironbridge Bookshop and opened the doors on the 28th December 2014. I was never really sure what I wanted to do with myself after school, but now I couldn’t imagine myself anywhere else. The first thing I did was take the shelves out of the windows to let in light and create window displays. It was a while before much happened as I was just trying to sell of stock and get fresh in. Just facing some books with striking covers outwards made a big difference. 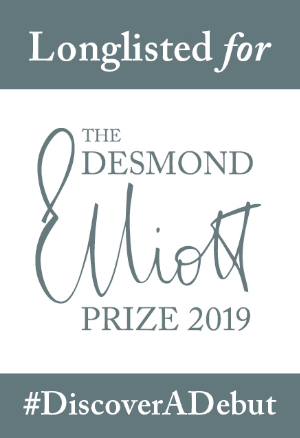 In 2015 I was one of the very lucky shops to win The James Patterson grant. The money went towards new shelving, carpet and a few aesthetic pieces to make it a more comfortable place to hang out, especially for children. Lots of colour and a table and chairs for them to sit and look through books. The work was done early 2016 and it was around the same time the Penguin Wall was taking shape. 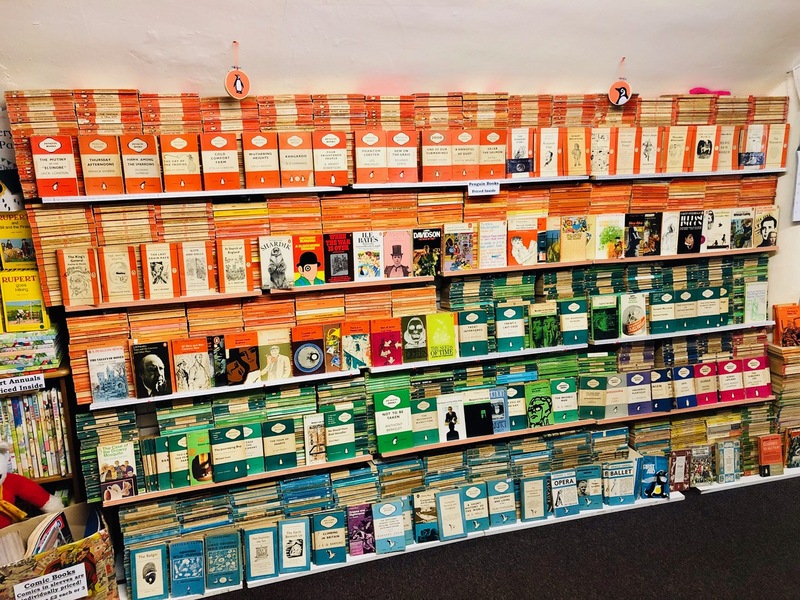 Penguin books are a big part of the shop and we now have collectors come from all over the world! Later in 2016 I had a new sign painted on the archway, then in 2017 the shop had a facelift, all new paint work, an orange (penguin coloured) door and a new blind with (Twice Told Tales) written on. 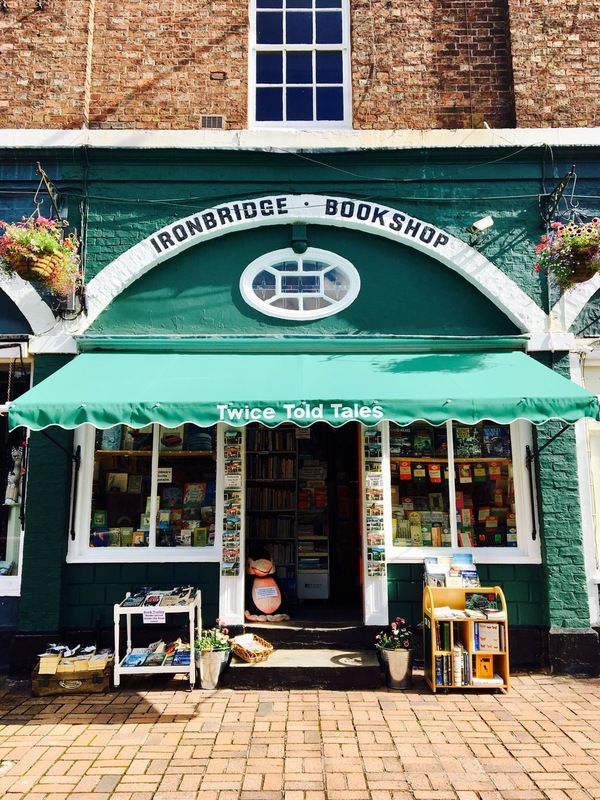 I was going to change the name when the sign was painted, but The Ironbridge Bookshop was already established so we use Twice Told Tales as more of a tag line. 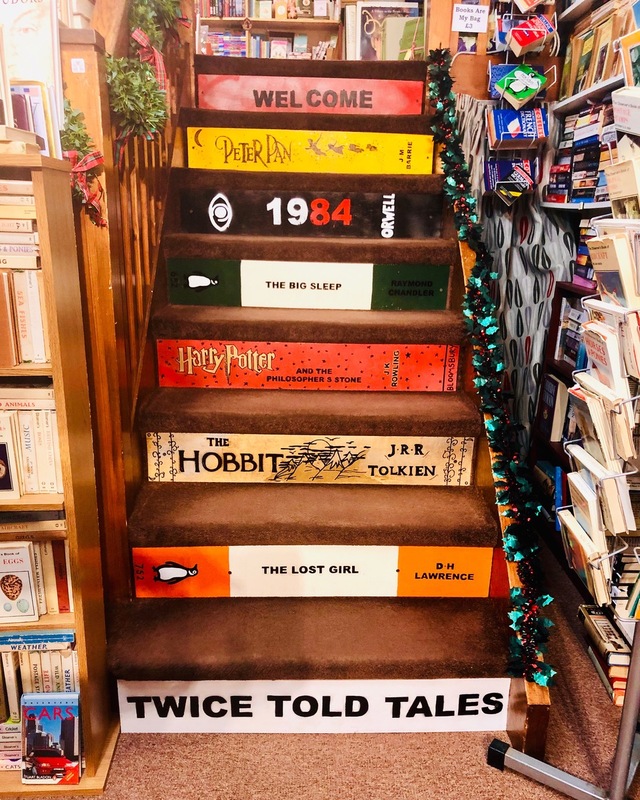 The same year saw the creation of the book spine stairs as Google were coming in to do a virtual tour and I thought it would be a nice feature, it’s proved popular! Each year gets better and better for us and I hope to be here for a long time. It’s so nice meeting new people everyday and having people come from far and wide just to see the shop. The more people we meet, the more the shop is pushed forward and the better we can help. The shop is pretty much where I dreamt it to be and look, I just wish it was bigger! There are plans for another facelift on a bigger scale, so watch this space! I don’t think it affected me too much. Online retailers will always be competition for independent businesses and it can be very difficult to stand against them. But bookshops and other independents provide a buying experience that you can’t get online. We all just need to keep doing our best to be a little unique. When I took the shop over a bit over 4 years ago, Kindles and ebooks had been around a while and in a way were dying out a little. Books had a bit of a revival and people were beginning to love them again. I was quite lucky that that was happening when my shop was up and coming. I know a lot of people were affected more negatively, we live in a nation that strives for convenience and that’s what kindles and online retailing provides. I was bought one when I was younger, as I would take a suitcase full of books on holiday and annoy everyone when they had to buy me clothes whilst we were there. I used it for a while and just before I had the shop I was travelling, so found it useful, but I sold it shortly after I came back. You can’t beat the feel of an actual book in your hand. I think it’s important to feel comfortable in a bookshop, almost at home even. Books cover every subject there is and that will attract almost everyone in one way or another. Feeling at ease whilst browsing is part of the book buying experience and, in a bookshop, you should feel as if you’re amongst friends. I try to let people browse a while before asking if I can help. I’m always more than happy to help match the right book with the right person. However, sometimes people like to look in silence, escape almost and let a book jump out at them. It’s also important to feel a part of the community. I love meeting and talking to people, whether it’s in the shop itself or online. We get so many tourists throughout the year and it’s unlikely that I’ll meet any of them again, but it’s great to know that we connected in a small way because of books. 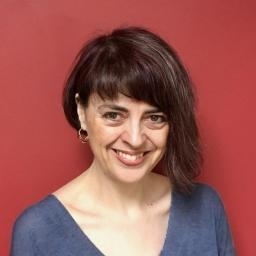 There is a great online book community as well. All trying to keep the love of books alive! 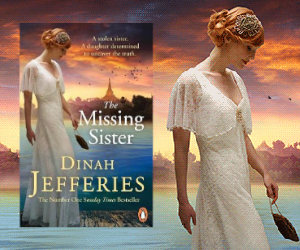 If someone fancies something a little different, I usually try and recommend a penguin book. Even though many of them are 80 years old, a lot of the titles and authors aren’t in print anymore and you won’t get anything quite like it. Also, anything by Terry Pratchett as he was the master of creating worlds for any age. If you love all things bookish, Jasper Fforde has written a series of books about a literary detective, Thursday Next. Investigating literary crimes, forgeries and stolen manuscripts in a world of ‘behind the scenes’ of books. You can jump into the middle of a chapter and the characters can jump out. Ever fancied spending the day with Hamlet? I probably wouldn’t recommend it. I’m particularly fond of the Penguin Wall. It’s taken 3 years to build up the collection and knowledge, I’m still learning every day! When I first had the shop there were about a dozen Penguin books and now there are nearly 3000. It’s always a nice talking point as they are much more than just books, they are collectors’ items and a piece of history in British Literature. There are also many reasons to collect them, whether it’s just for aesthetic reasons or to gain the satisfaction of having the first 1000 in great condition. It’s nice when people strike up a conversation about the colour coding or an obscure title. In the Middle Ages the only people who had enough time and were educated enough to write books were Monks and, because there were no printing presses, all the books were handwritten in beautiful script. Because of the lengthy process oftentimes the young monks would get bored and would illustrate in the margins of where they were writing. This meant you had illustrations of people doing daily tasks in these books or outlandish things like knights fighting atop giant snails. Much More Books & Music in Much Wenlock is my ‘local’ bookshop in a way. They usually have a friendly cat and dog roaming around to greet you, also their stock is always great. From comics to fiction and if you like music and vinyl, they have a room full! The Raven Bookshop in Shrewsbury (Market Hall) is another great shop, a brilliant selection of fiction at great prices and always very welcoming! I often chat with them on social media and usually end up with a pile of books on reserve. Aardvark Books in Bucknell, Shropshire – they have almost endless shelves and a café with great cake. Their children’s section is wonderful, the last time I was there they had a huge castle you could read and play in. Even though our shop is small in appearance, we’re more than just a shop. Bookshops are the hub of communities where people with a common interest can gather. We do a lot of business through social media, Instagram especially. We do a lot of trade on there and have met some amazing people in the past couple of year, it’s helped raise the profile of the shop and the importance of books. We do mail order all over the world and are always happy to match the perfect book with its owner. 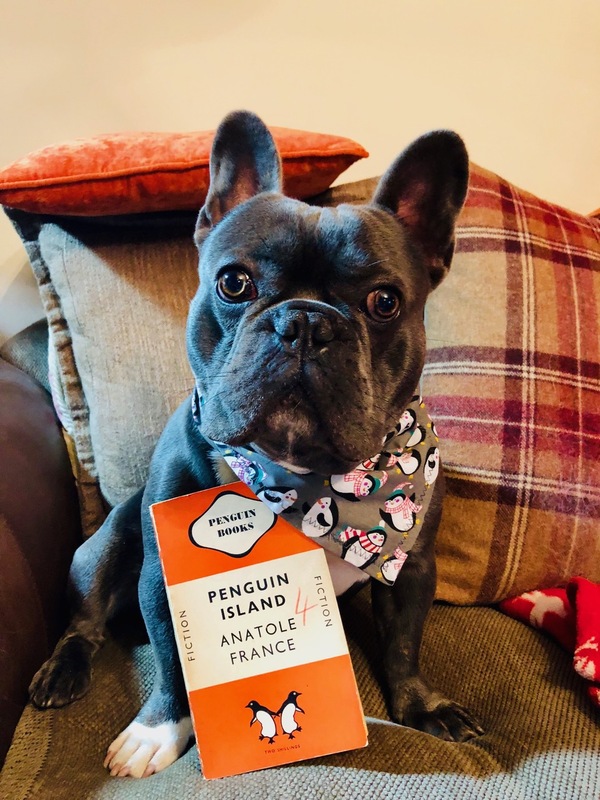 I did a talk on Penguin books last year at the Hay-On-Wye independence weekend celebrations which was great fun. They have something going on every year at the beginning of April and of course for the fantastic Festival in May. I was officially unofficially crowned the youngest bookseller in the UK. I have some helpers with photographs in the form of my dog Bear and a clan of cats. Our newest edition Wilson seems to have taken a liking to books.